If you pay attention to your credit card statements - and you absolutely should - you may notice that you're being charged interest some months. Your credit card balances are charged interest any time you carry the balance beyond the grace period. Interest is calculated based on the rate disclosed to you when you sign up for your credit card. Credit cards can have fixed or variable interest rate. The difference between the two will affect when your interest rate can change and whether you have to be notified. A fixed interest rate generally remains the same but can change under certain circumstances. 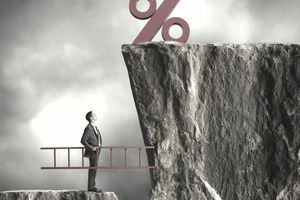 After the new credit card rules go into effect, fixed interest rates can’t increase within the first year of the account’s opening unless it’s for one of the reasons listed above. If your credit card issuer raises your interest rate, they must give you 45-days advance notice before the increase becomes effective. You're allowed to opt-out of the interest rate increase and repay your balance at the old interest rate. What’s Different About a Variable Interest Rate? A variable interest rate is tied to another interest rate, usually one that moves with the economy. The variable interest rate is a certain number of percentage points above the index rate. (The difference between the two rates is called a margin.) For example, the variable interest rate on your credit card might be prime + 13.79%. In that case, the margin, 13.79%, is added to whatever the prime rate is at the time to come up with your interest rate. Prime is currently 3.25%, making your interest rate 17.04%. Your variable interest rate will go up and down as the underlying rate goes up and down. Credit card issuers don’t have to send you an advance notice when your variable interest rate goes up because the underlying rate has gone up, so you won’t know if your interest rate has changed unless you pay attention to your credit card billing statement. If your credit card issuer increases the margin portion of your variable interest rate, the fixed interest rate increase rules apply. Your card issuer will be required to notify you in advance of the chance, giving you the chance to opt-out. Is a Fixed Rate Better Than a Variable Rate? The primary benefit of a fixed interest rate is the requirement of advance increase and the ability to opt-out of an interest rate increase. Opt-outs may save a few dollars in interest charges, but they can hurt your credit. With variable interest rates, you can find out when your interest rate will be increasing if you pay attention to news about when the Feds are increasing interest rates. You can avoid paying interest completely by paying your balance in full at the end of each month. That way, it won’t matter whether your interest rate is fixed or variable.